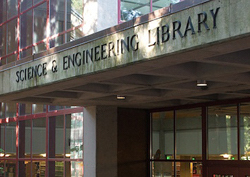 The UCSC University Library, founded in 1965, is one of the smallest general libraries in the University of California system and the largest research library between Stanford and Santa Barbara. Our relative youth and manageable size have allowed us to grow responsively with the campus and its programs and to innovate and adapt with agility to new information technologies. We share with other academic libraries a commitment to intellectual freedom and the widest possible access to information. This commitment is reflected in our open stacks, our active interlibrary loan service, our online catalog, and our robust Web site linked efficiently to other sites and databases.We have mutually beneficial partnerships with libraries at other University of California campuses, local California State Universities, community colleges, and public libraries. Our active participation in the California Digital Library promises to enhance this collaboration to a new level. We have already developed a distinctive identity both in our interdisciplinary collections, and through our profound commitment to service, outreach and library use instruction, especially to undergraduates. The high quality of these services depends on an outstanding staff, which, because of its relatively small size, is versatile, broad and deep in its subject and technical expertise. Our size allows us to be directly and personally responsive to donors, whose gifts and endowments have a more obvious positive impact on our collections than they would on larger libraries. The University Library strengthens the UCSC academic enterprise by providing, presenting, and preserving a wide range of information resources. We utilize innovative approaches in working with faculty and students to help them discover, use, manage, and share the array of information that supports their research, teaching, and learning.